It's Tuesday and that means it's time to learn a new technique. 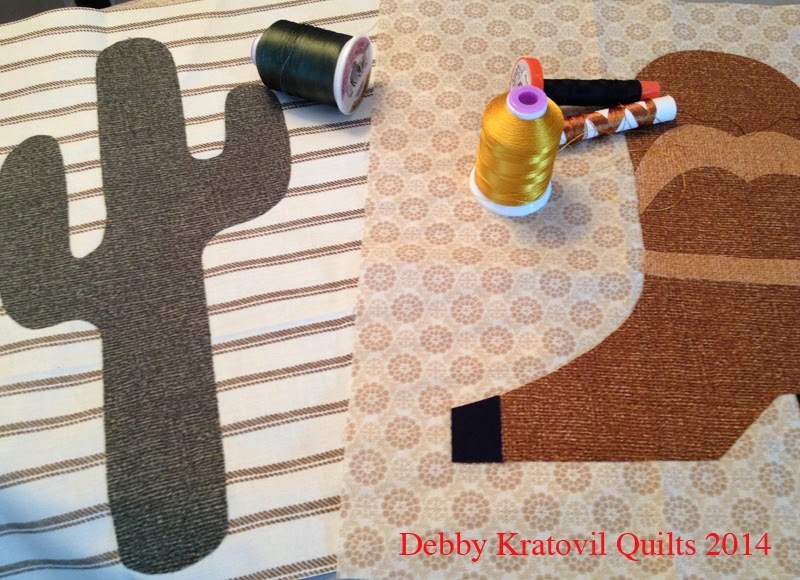 OK, maybe not to all of you, but Debby Kratovil is our guest today and she shares some tried and true methods for raw edge applique using our new collection called Wild West Saloon by Maria Kalinowski for Kanvas. 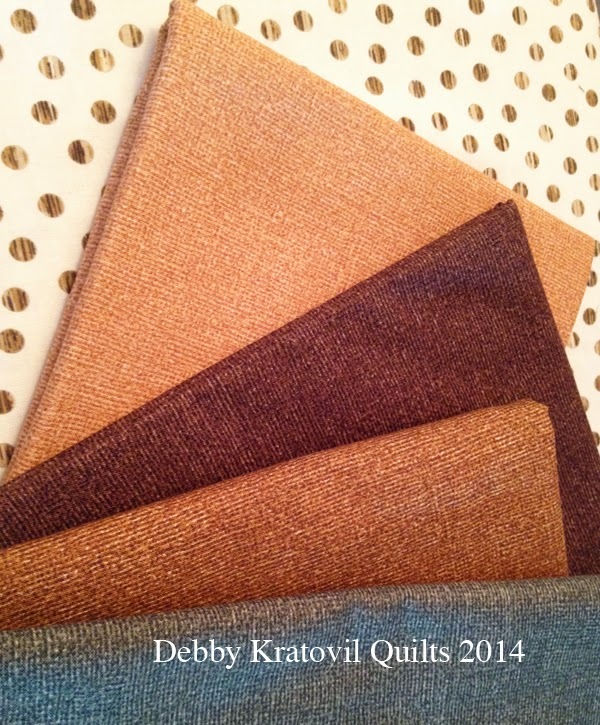 Q: Debby, tell us why you chose this collection? A: Well, I'm married to a Texan. Is that enough of an answer? While he isn't into guns or poker (well, sometimes he can be enticed to play with the guys), he loves those boots. Hey, where is the picture of the boots? These boots were made for walking . . . When I showed the collection to Phil, it was a no brainer. He said, "OK. Where's my quilt?" Q: What did you decide to make? Q: Show us the blocks, please! Keep your distance! I've got pricklies! Then I pulled up my Boot Block. No spurs on this one! Now it's time to show you the steps! Step 1. Transfer template markings to the paper side of freezer paper. No need to reverse because I always place my freezer paper templates to the right side of the fabric and NOT the fusible web side. Step 2. Rough cut a rectangle of fabric (I used the green from the Burlap Collection) and iron a rectangle of Heat 'n Bond Lite to the wrong side of the fabric. Now there are 3 layers. Step 3. 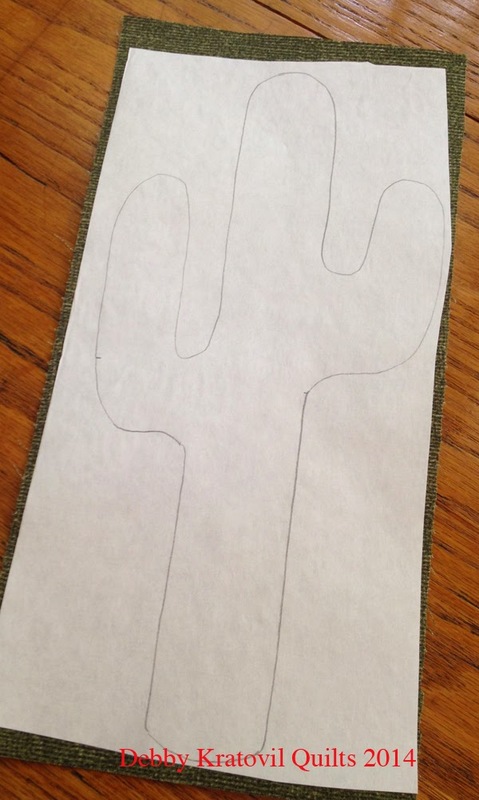 Cut out the cactus! Step 4. Center the Cactus over a 12-1/2" background square and fuse in place with an iron. Step 5. Time to stitch. It's hard to see the stitching from the front, that's why I am showing the wrong side. Notice the tiny zig zag machine stitches. Step 6. Now for the boot. 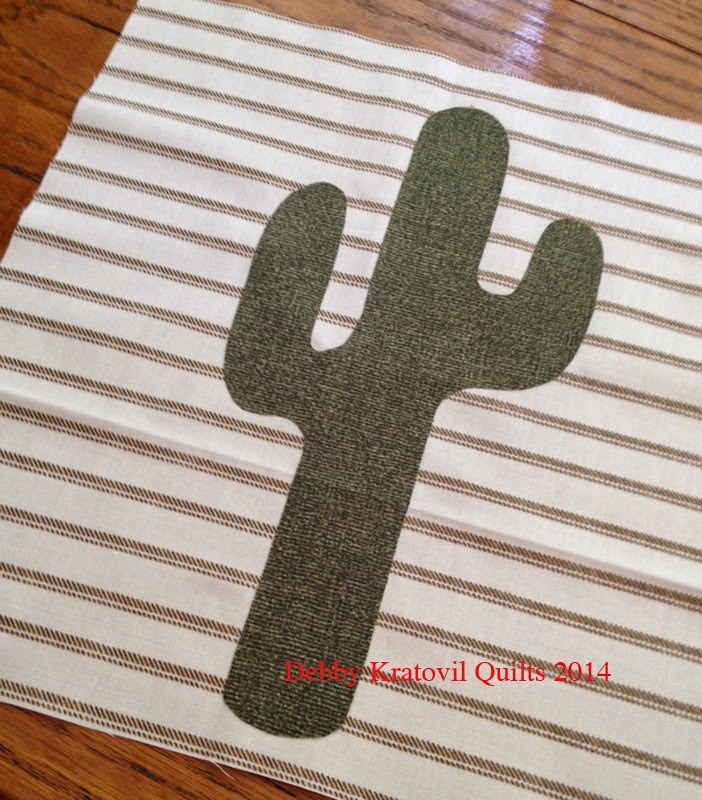 I used the Burlap "Nutmeg" color for that. 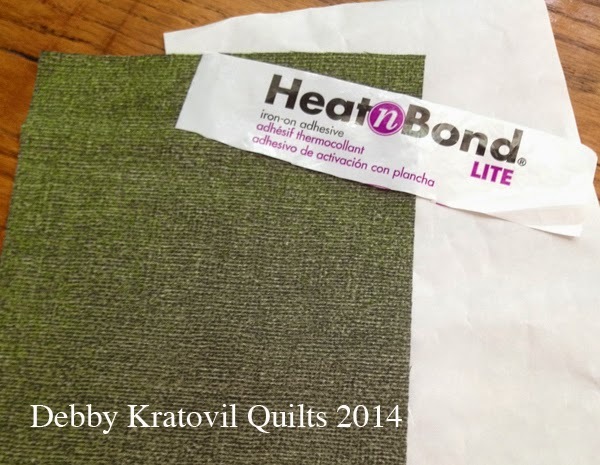 Drew the boot, rough cut the freezer paper and then ironed it onto the fabric with Heat 'n Bond Lite on the wrong side. Notice I've included the placement for the extra patches. More on that later. Step 7. Cut out the boot details. Step 8. 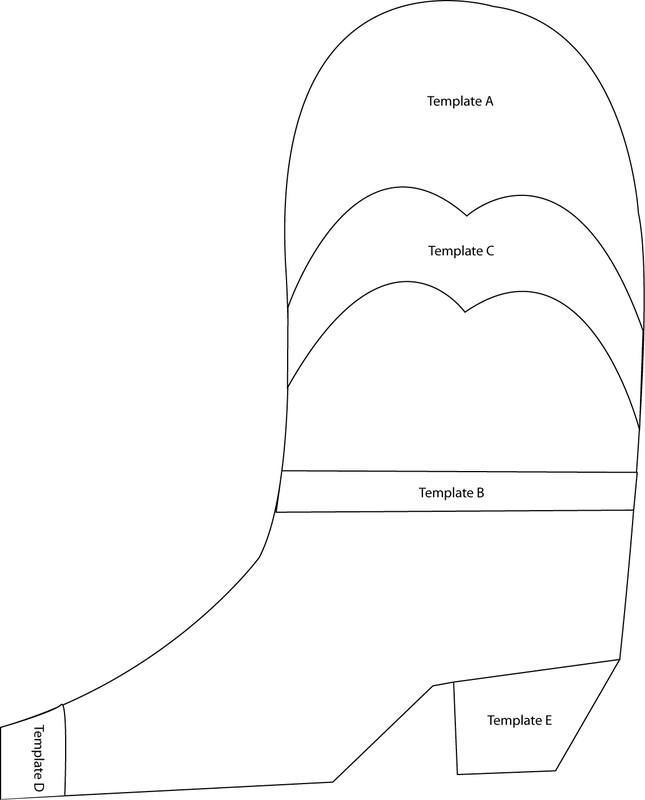 How do I align those detailed patches to the boot shape? Well, check this out! 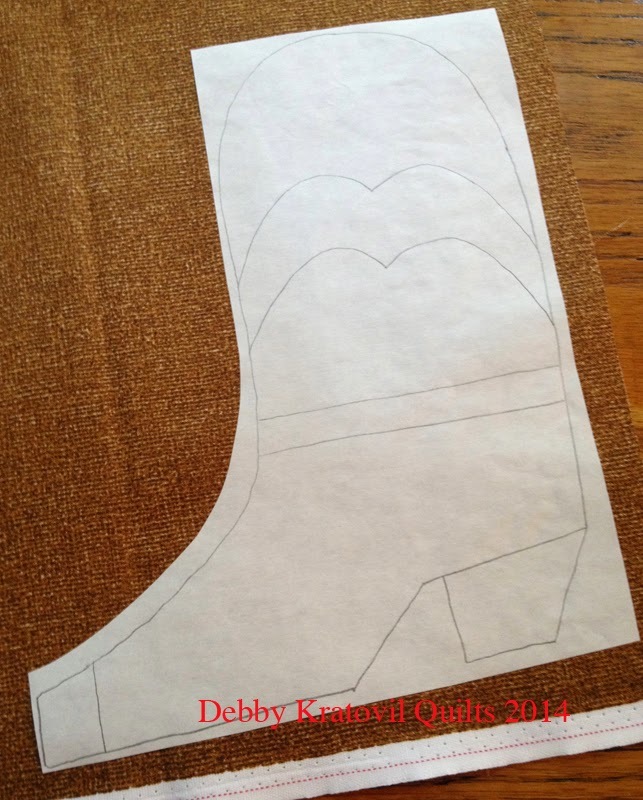 Turn the freezer paper template over and use the placement lines to line up the shapes. You may have to hold this up to the light. Gently lower the freezer paper template and shape down onto the boot and do a little sneaky-peeky to check and see if it's "close enough for government work" and then hit it with an iron. Repeat for remaining Patch B. Step 9. Cut out the black boot details and fuse in place. Now we're ready for applique! But first I had to dig through my mounds of thread to find something that would work. I was in luck! 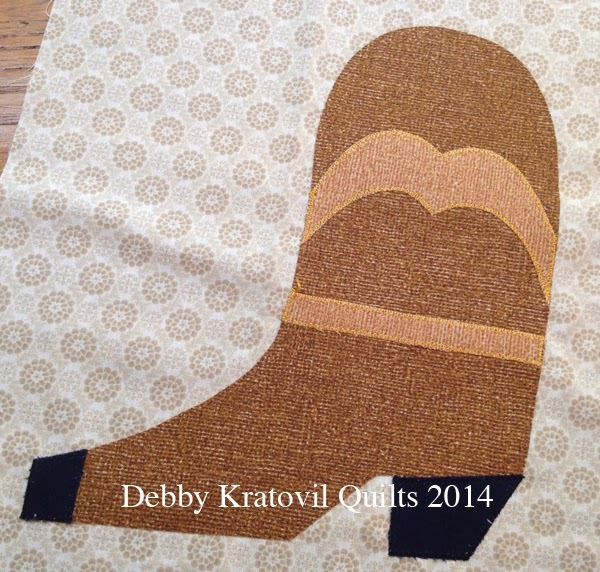 Here is the boot already appliqued. I found a beige background print, again from an earlier Benartex Collection (Winter Traditions). Step 10. Make some alternate blocks. 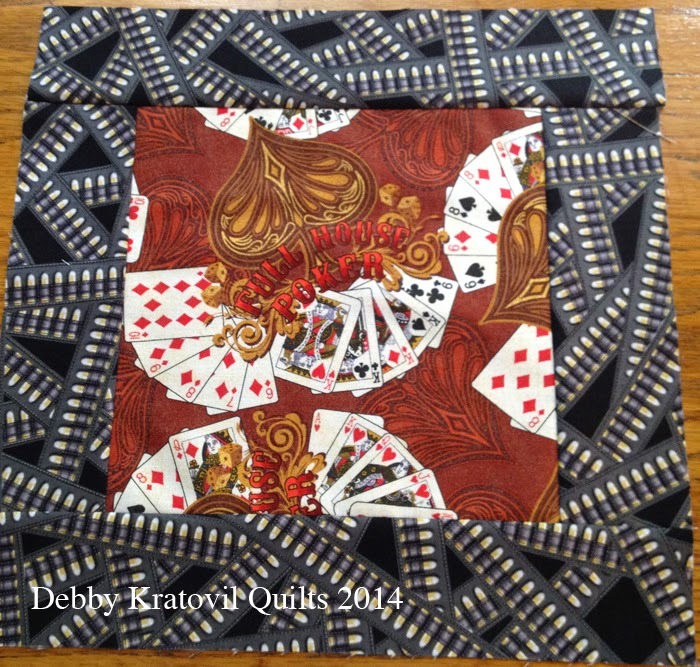 I used the Burlap Blenders again and selected two main prints: Poker and Boots, a good combo for a cowboy. 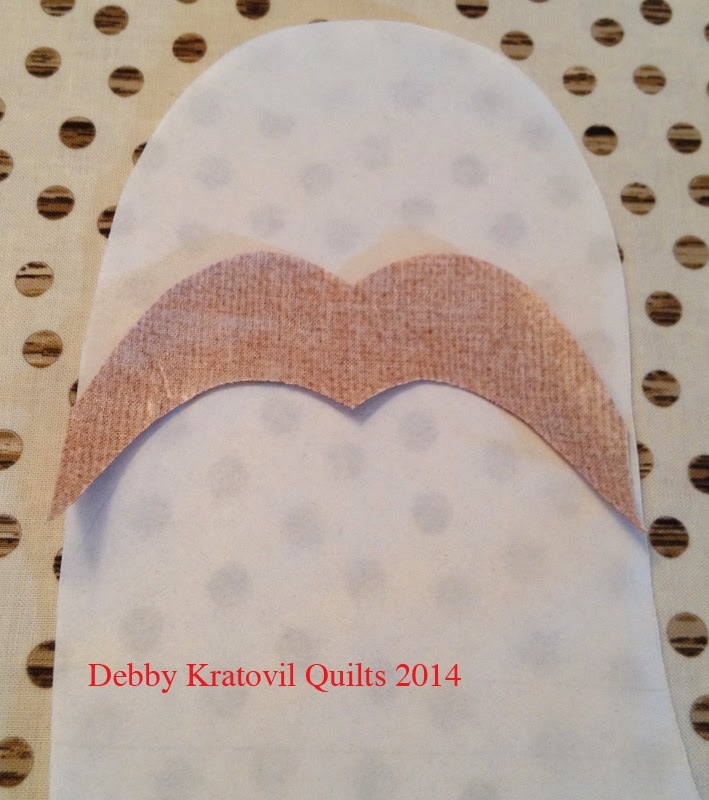 Centers are cut 8-1/2" squares. 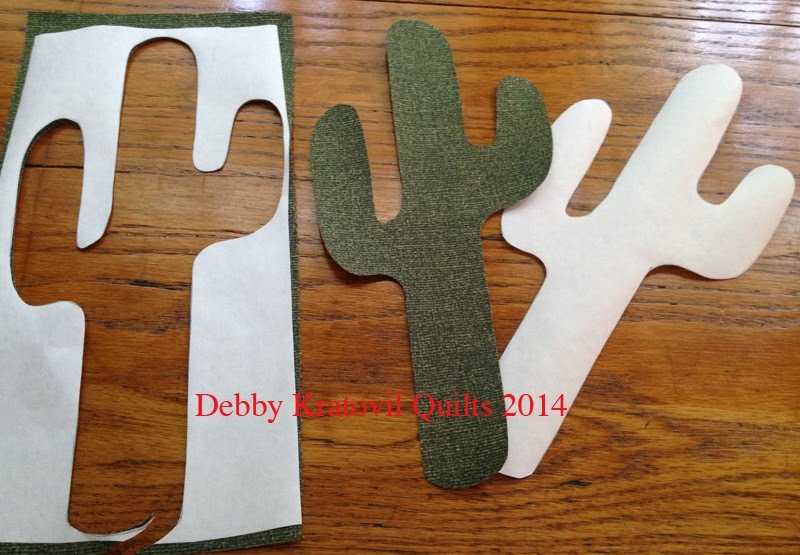 The side strips are 2-1/2" x 8-1/2" and the top/bottom strips are cut 2-1/2" x 12-1/2". Easy. Sure to be a winning hand! Q: So, what does it look like all together? 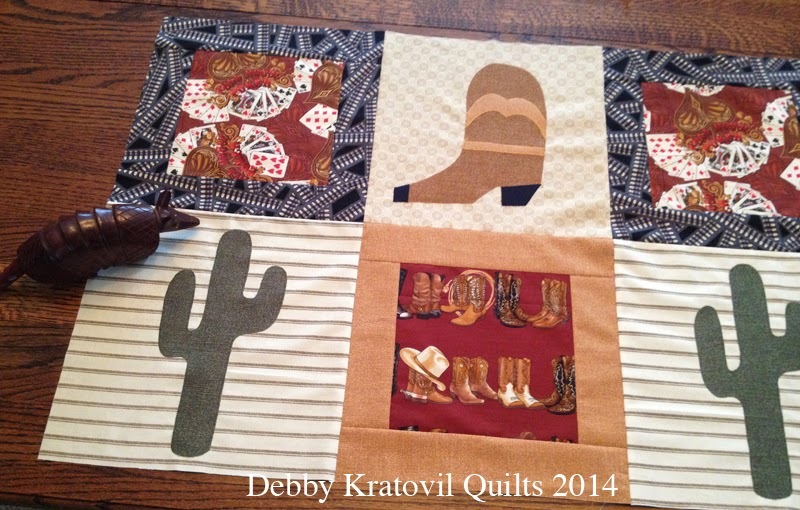 A: I only have 6 blocks finished and my husband's armadillo insisted on getting in the photo! 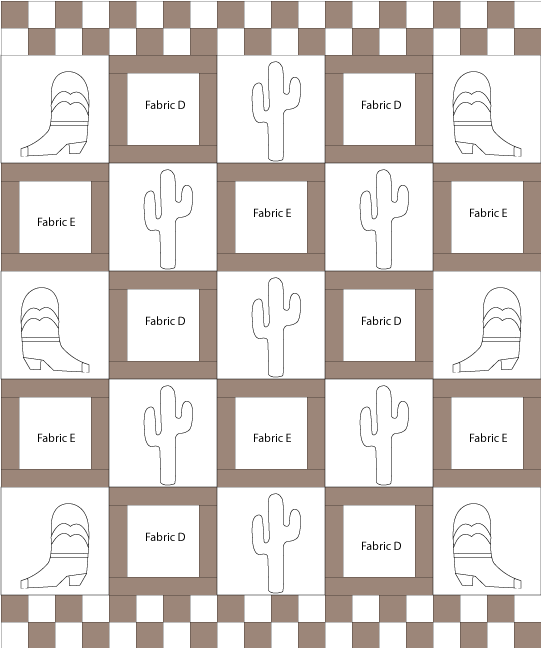 I have an assembly diagram for the larger quilt that I'm aiming for, along with the full size templates that our visitors can have. Yardages are on your own. 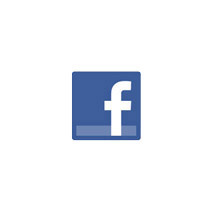 Bookmark this page for the Alternate Blocks information. 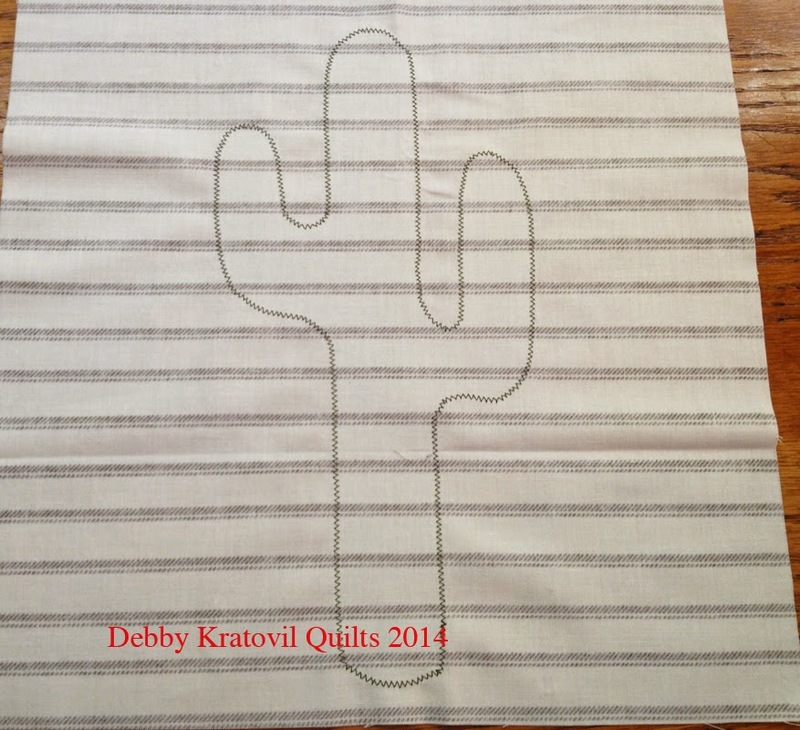 But here is a digital layout of how my pattern goes together. It is contained in the 3 page pdf (link below). 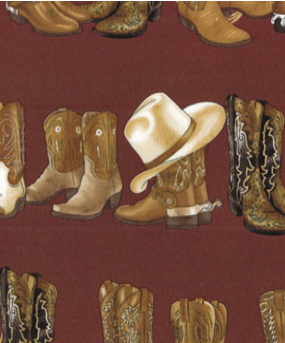 Best of the West pattern made with the Wild West Saloon Collection is HERE: Western Saloon Pattern. 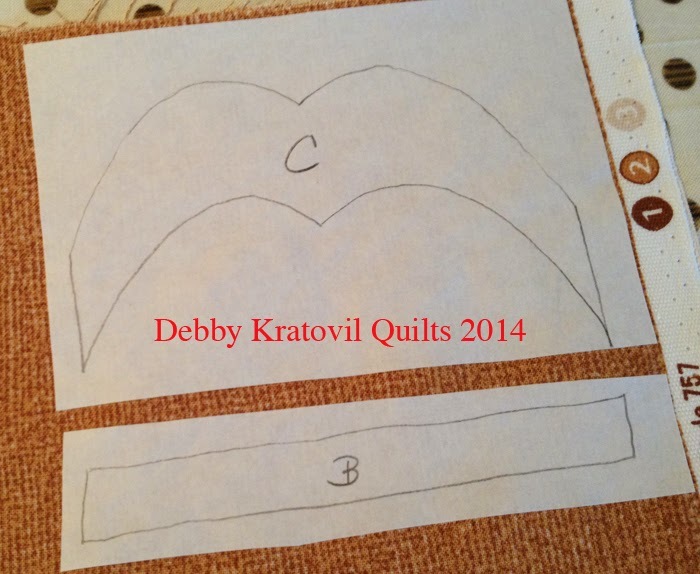 Thanks, Debby, for walking us through your applique techniques! 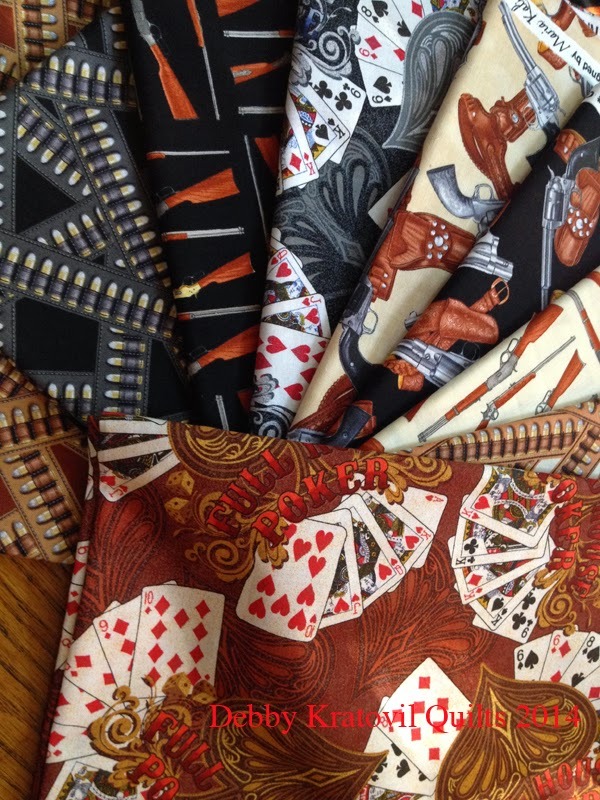 And don't forget to check out the entire Wild West Saloon collection here--perfect for any cowpokes (or wannabee cowpokes) in your life! Do you use any stabilizer on the back of the background fabric when you zig-zag/applique to keep things from puckering? Great pattern! 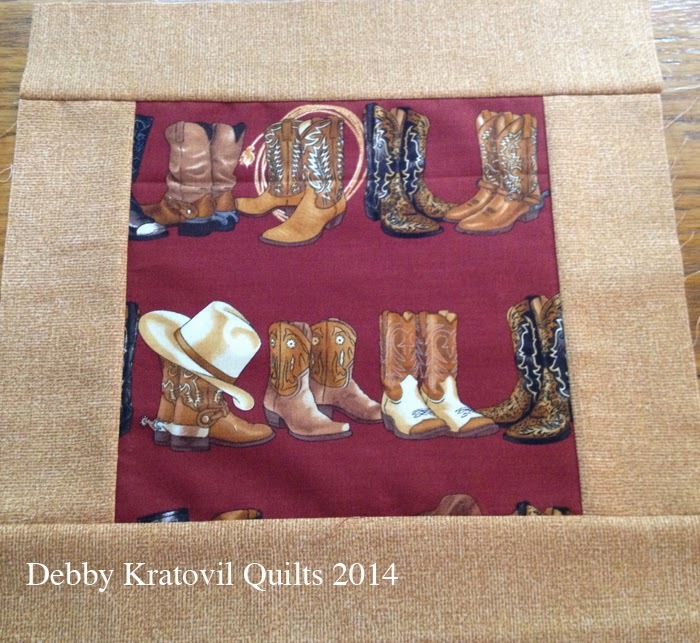 Thanks for sharing and for the appliqué tips. I had a class with Debby she is wonderful..